This week marked four years to the day of the worst day of our lives. 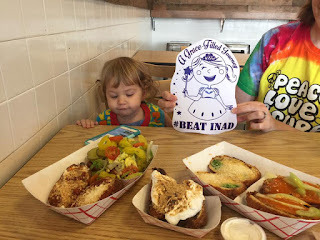 It was the day we found out Grace had INAD. And although so many things have changed since that day, I can remember every single detail of that one day. It started off like any other day. 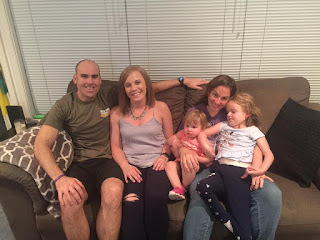 Then, three-year-old Grace was at preschool in the morning, and while I was at work, I got a call from Grace’s geneticist at Children’s Hospital that they got the results of her genetic testing. The whole exome sequencing test, which looks at all 20,000 genes in the human body, was done in July, and was expected to take six months to complete. This photo will always remind me of the day we found out Grace had INAD, but it also serves as a reminder to constantly look for ways to be happy. Although, to some that would seem like an eternity to wait, I don’t think we honestly thought much about it. We knew there was only a slim chance the testing would turn up any results. And by slim, they told us less than 25 percent. A friend of ours in the genetics world, said in actuality, it’s closer to 15 to 20 percent. Because although the testing looks at all 20,000 genes, science only knows what 5,000-6,000 of those genes do. So, we had the blood work done together in July, and then promptly forgot all about it. Grace had done other genetic testing and medical procedures to see about determining why she had some developmental delays, and they didn’t turn anything up. I just figured this test wouldn’t turn anything up either. But that wasn’t meant to be in our world. 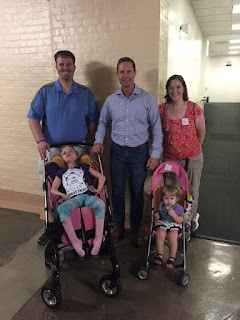 After I picked Grace up from school, Kyle and I took her to the back of the newspaper office and called the genetics department at Children’s Hospital, certainly not ready for the news that would come. Her geneticist, who is one of the most patient and compassionate medical professionals we have every encountered, carefully explained to us that Grace had a very rare genetic disorder called INAD, and that she would likely never recover. It was a blow of monumental proportions, and I couldn’t even think straight. I took Grace to Litchfield to meet my mom for a standing Thursday lunch date at the Ariston and Kyle made sure to call his mom at work. 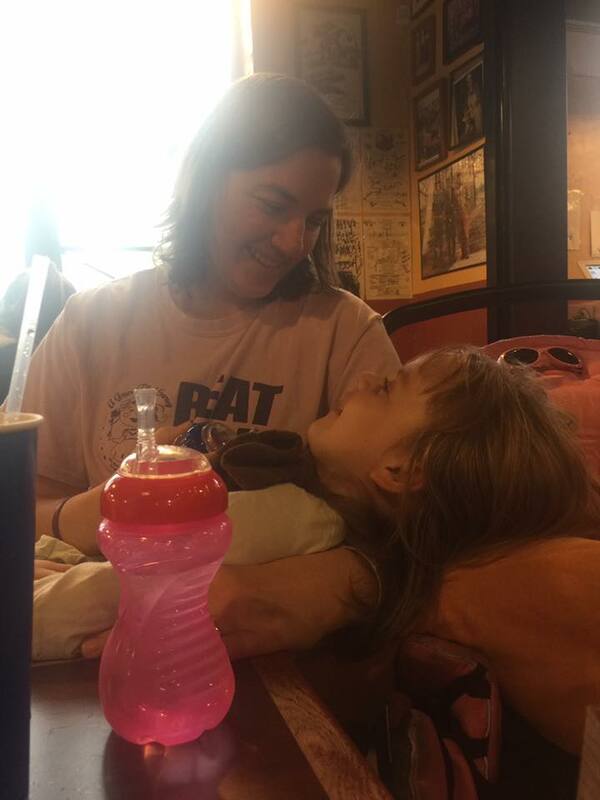 I asked for a table in the back for lunch, and could hardly find the words to tell my mom that her only grandchild wasn’t likely to reach her tenth birthday. 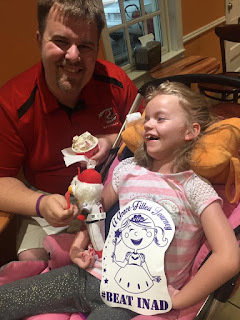 Although Grace usually has physical therapy in Springfield on Fridays, she had an appointment at Children’s Hospital that day, so we scheduled PT a day early. 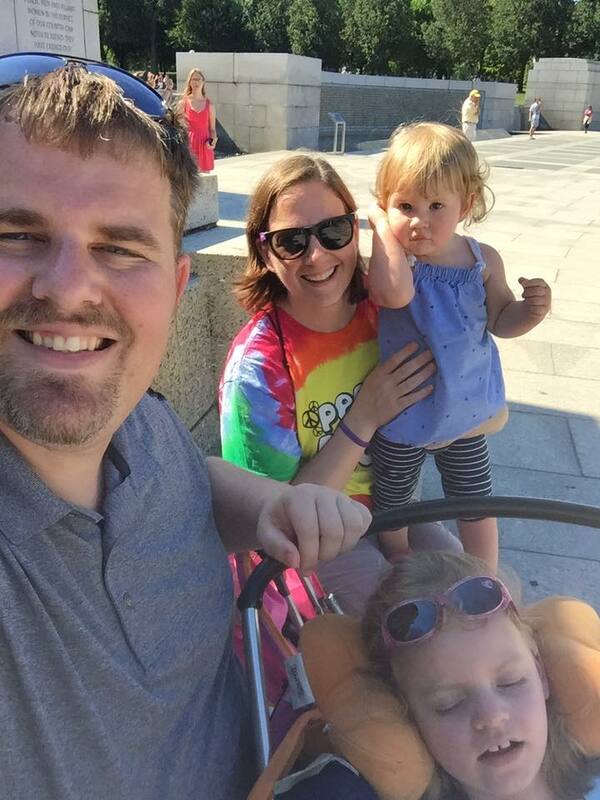 I had planned to take Grace on my own while Kyle worked, but he offered to come with me so I didn’t have to be alone. He met us in the parking lot outside the Ariston, and as we looked up, we saw a photo of the three of us on a billboard just outside Walgreens. 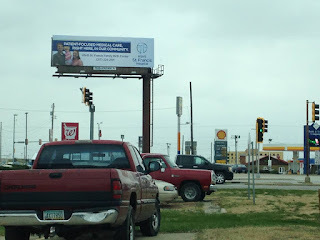 Months before, we had agreed to be spokespeople for the Family Maternity Center at St. Francis Hospital (which is still our favorite place), and our billboard was put up that very day. That’s one of the ways I remember the day we found out Grace had INAD. 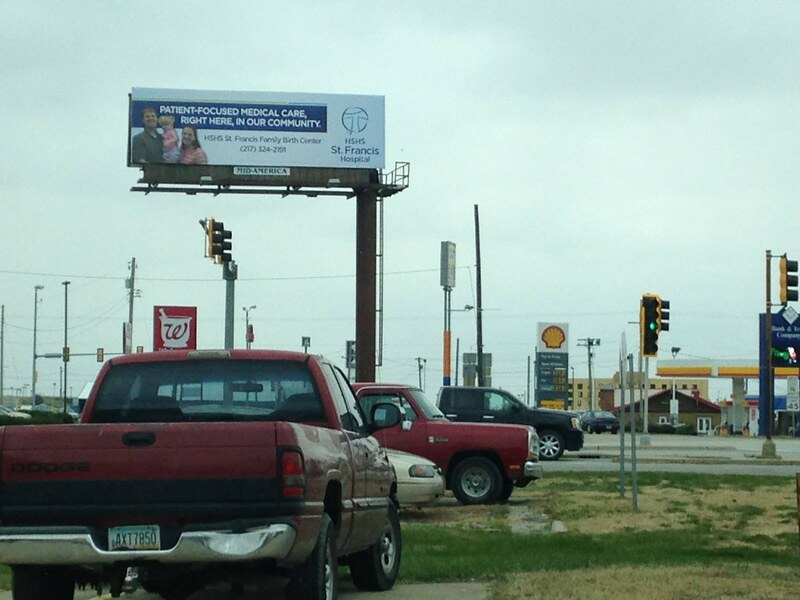 Kyle downloaded the Timehop app on my phone, and the #foreverhappydays photo from that day is a picture of our billboard. We had done our #foreverhappydays photos for more than 180 days at that time, and had to decide whether or not to continue. My first thought was that we would never find a way to be happy again. I mean, our beautiful, only child had been diagnosed with a terminal illness that had no treatment or cure. What could there possibly be to be happy about? It turns out a lot. 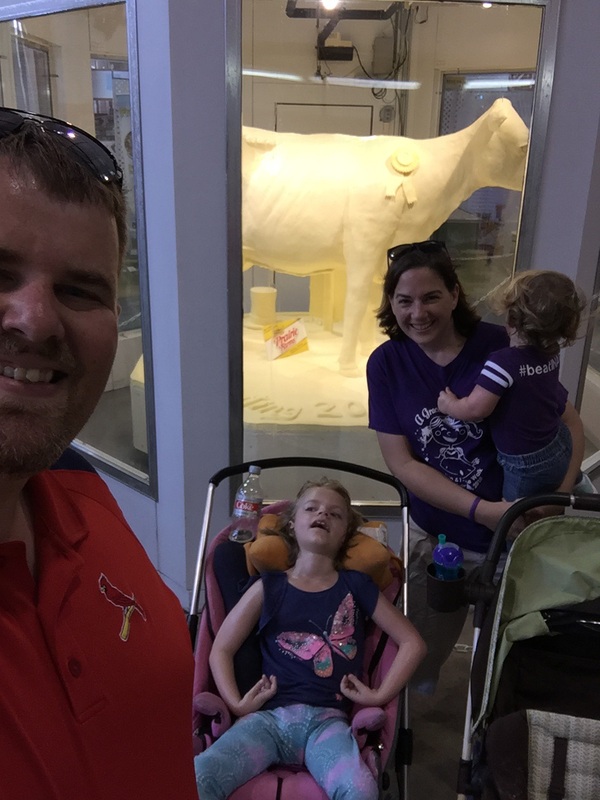 And while many things have stayed the same, like countless doctor’s appointments for Grace in St. Louis and weekly trips to therapy, much has changed, like the addition of our spunky daughter, Charlotte Grace, who will turn two in February. 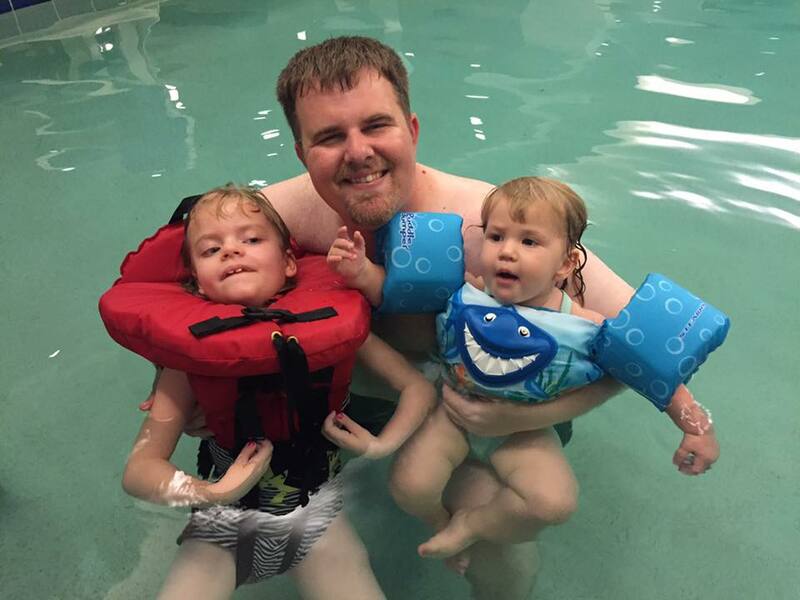 We use the doctor’s appointments and therapy sessions as a chance to have adventures together. 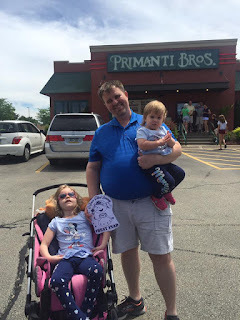 Maybe we try a new restaurant or enjoy an afternoon at the St. Louis Zoo. 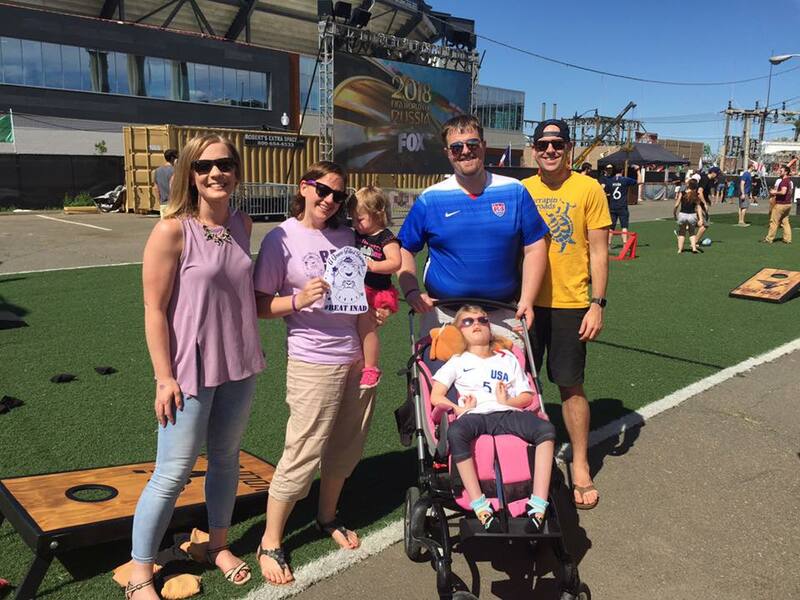 But we always try to turn something that could be difficult into something we can all enjoy together as a family. Shortly after Grace was diagnosed with INAD, Kyle and I had a fight in the kitchen. I was so angry that this could happen to our family. And he told me that I had two choices, I could continue to be angry, or I could find ways to be happy. He said that if I picked angry, I would miss all the really great things about Grace. And he was right. We decided to continue our #foreverhappydays photos. While it’s sometimes a bitter reminder of the skills Grace has lost over the years, it’s also full of happy memories and a constant reminder that life is to be celebrated. A friend of mine sent me a bookmark once that said, “Life doesn’t have to be perfect to be wonderful.” And our life may not be the perfect picture we hoped and dreamed for, but it’s pretty great. While Nov. 13, 2014 may always be one of the worst days of my life, that photo of the billboard is a great reminder of why we celebrate life every moment we’re given. 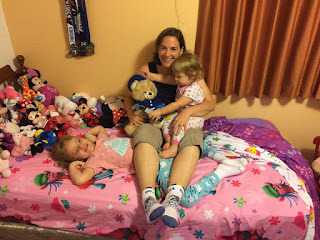 We've been pretty fortunate when it comes to doctor visits with Grace on our journey with INAD. Grace has been remarkably healthy despite this terrible disease, with just one one-day hospital stay in the books so far. 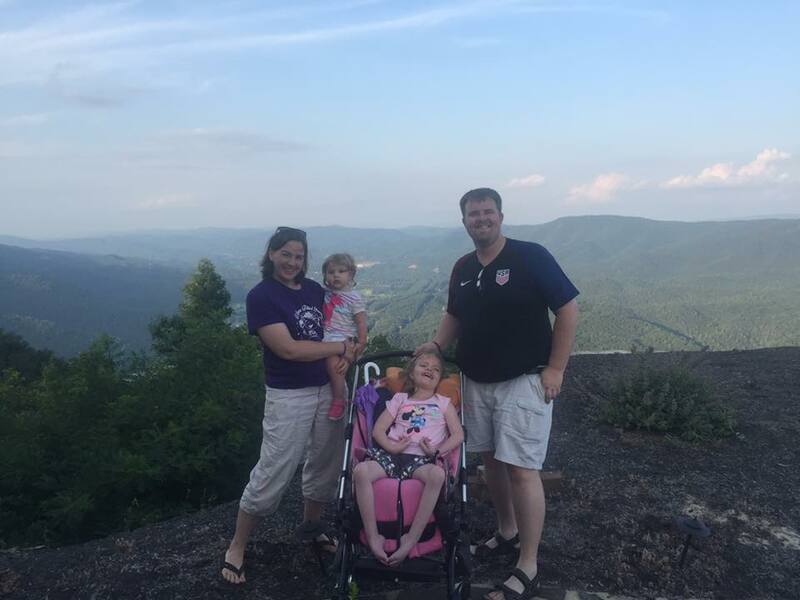 We still see Dr. Ishmael at Litchfield Family Practice if Grace is seriously under the weather, but as far as specialists like orthopedics or ophthalmology, usually a routine annual visit is enough. 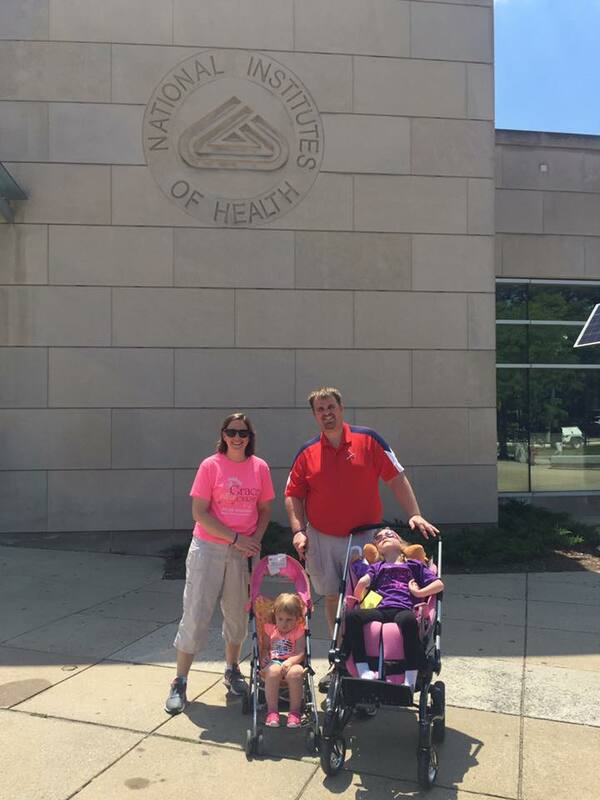 We had one of those annual visits on Monday as we made our way to St. Louis Children's Hospital. 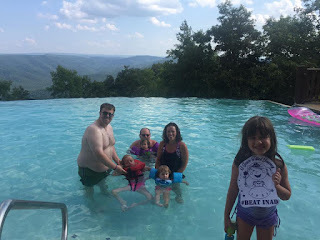 These trips are more of a necessity than a fun road trip, but we've done our best to make the visits as enjoyable as possible, usually adding in a trip to the zoo or a fun place to eat either before or after. 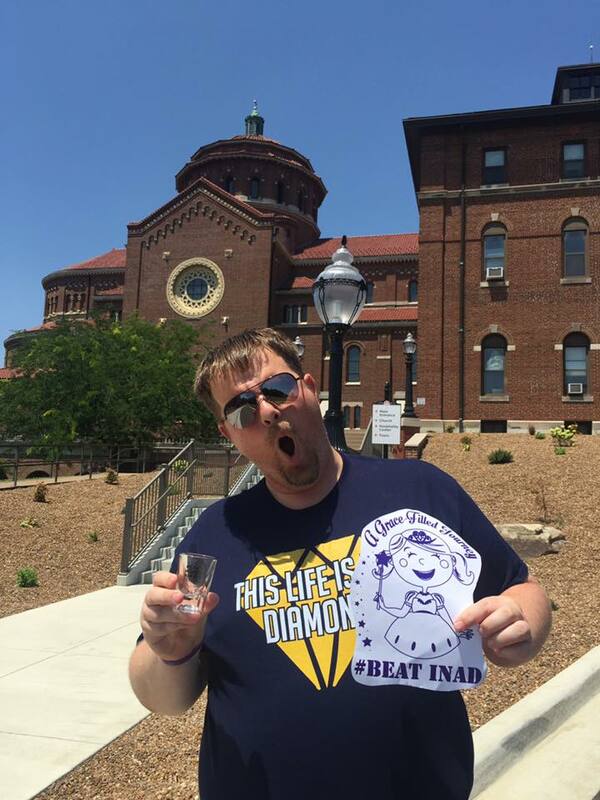 We weren't sure if that was going to be possible this time around as we were meeting a new neurologist at 11 a.m. and set up a meeting with Dr. Kotzbauer at 2 p.m. to catch up and talk about his work in INAD research. Three hours may seem like a long time, but last year they were running an hour behind at neuro so we had in our minds that lunch at the hospital cafeteria might be in the cards. Grace was all smiles when we had lunch at Pappy's. To be completely honest, neurology appointments have been a mixed bag for us. Some have been really good and productive. Some have not. We will leave it at that. That changed today as we had one of our best appointments period, and we're not saying that just because we told her about our blog. Dr. Griffiths listened to us, wanted to know about Grace and provided us with a lot of information about things we had been wondering about. We even had some of the hard conversations about the future, a topic that has left us less than thrilled in previous appointments. Dr. Griffiths' compassion and the fact that she listened to us made all the difference in the world and we left Children's today with smiles on our faces. 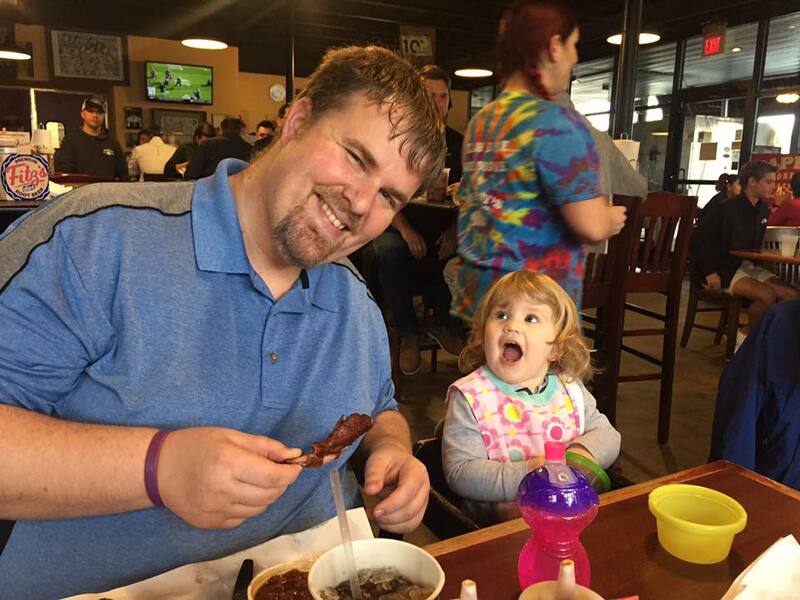 Charley was just as excited as her dad about lunch! We also left at 11:45, meaning that the world was our oyster in terms of lunch options. Normally on our trips to St. Louis, we go for a familiar name, literally. Grace Meat+3 has become one of our favorite places in the world, because of its food, because of its atmosphere and because of its amazing people. Unfortunately, it's closed on Monday and Tuesday, so Monday doctor appointments force us to look elsewhere. 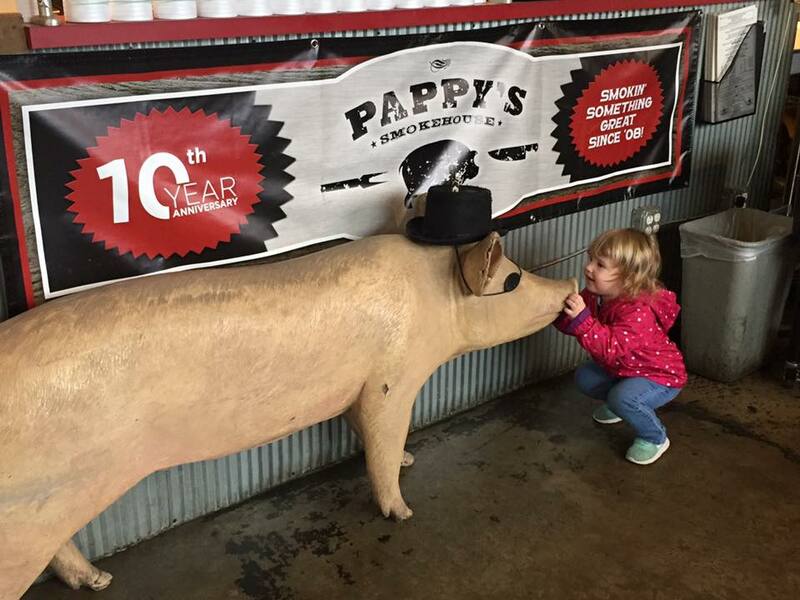 On the bright side, one of the country's best barbecue restaurants is just a few blocks from the hospital so Pappy's Smokehouse has been our regular Monday post-appointment haunt. 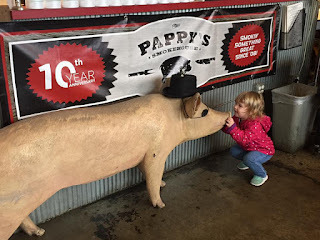 Grace was given a little pig on our first visit to Pappy's and Charley had her first real food there after another appointment. I have an awesome picture of her sucking the barbecue sauce off one of the rib bones. As always, the food was excellent and the staff was super nice. Despite it being straight up noon, no one rushed us away as Mary fed Grace, which takes a little over an hour under ideal conditions. There's a level of comfort at Pappy's that is similar to what we love about Grace Meat+3. You see people of all walks of life there, all coming together to enjoy the fruits of someone's brilliant labor. Charley loves making new friends! After lunch we visited with Dr. Kotzbauer at his office, dodging raindrops to get from the car to his office building at the Washington University School of Medicine. The work that he is doing with gene therapy and enzyme replacement therapy is jaw dropping. Progress is never as fast as he, or we, would hope, but we know that the work he is doing now has potential to be very important down the road. 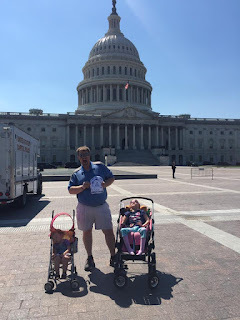 It's always fun to catch up with him, tell him about what Grace has been doing and visit with members of his team. We are extremely fortunate that he works in St. Louis and is so eager to take time to talk with us. As I said earlier, these trips could be a chore. We'd much rather be hanging out at home or doing something a little more fun with the girls, but as we've found out on our Grace Filled Journey, life is what you make of it. Ultimately, when all is said and done, we won't remember the waiting rooms and long drives. But we will remember the compassion of those caring for Grace and the good times that we get to have as a family. 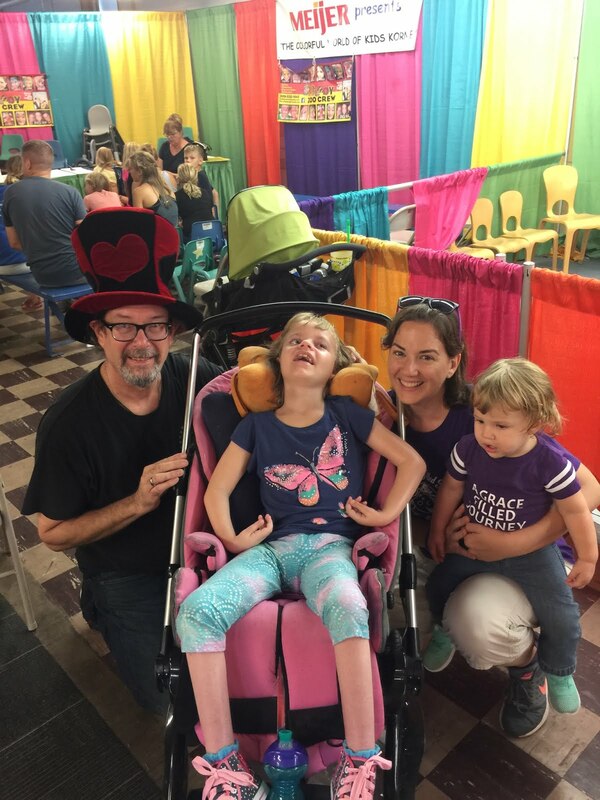 While she may not be able to tell us, we know that the State Fair has always been a special place for Grace. 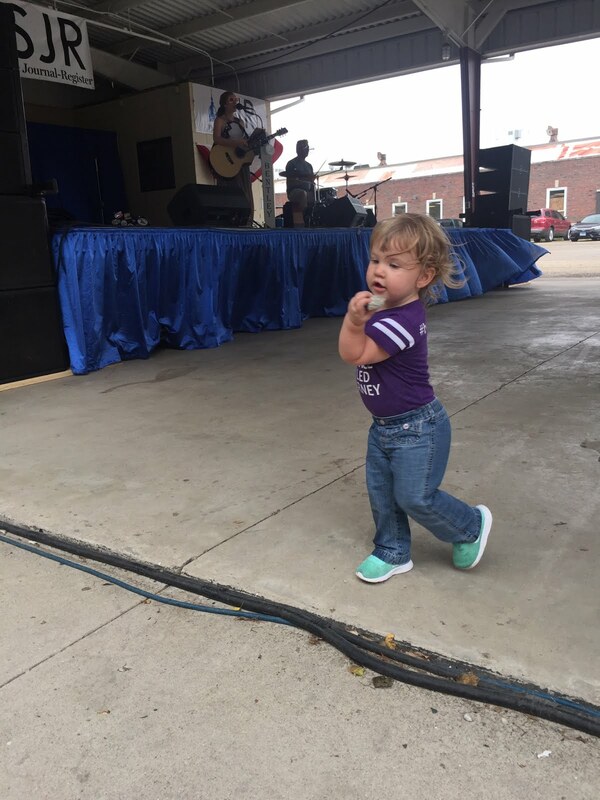 She received her AmTryke from the Springfield American Business Club at the State Fair. She got her picture taken with Queen Summer Robbins at the State Fair. And she had her first mini donut at the State Fair. All memorable moments for sure. Charley got to pet a rabbit in the FFA tent! Kisses for a baby calf! This year was no different as we had one of our best trips to the fair yet. We weren't sure we were going to make it in 2018 due to some time conflicts, but we managed to find some time to go on Friday, Aug. 17. Mother Nature threatened to rain on our parade, literally, but we avoided the heavy stuff for the most part. Hanging out with the baby chicks! 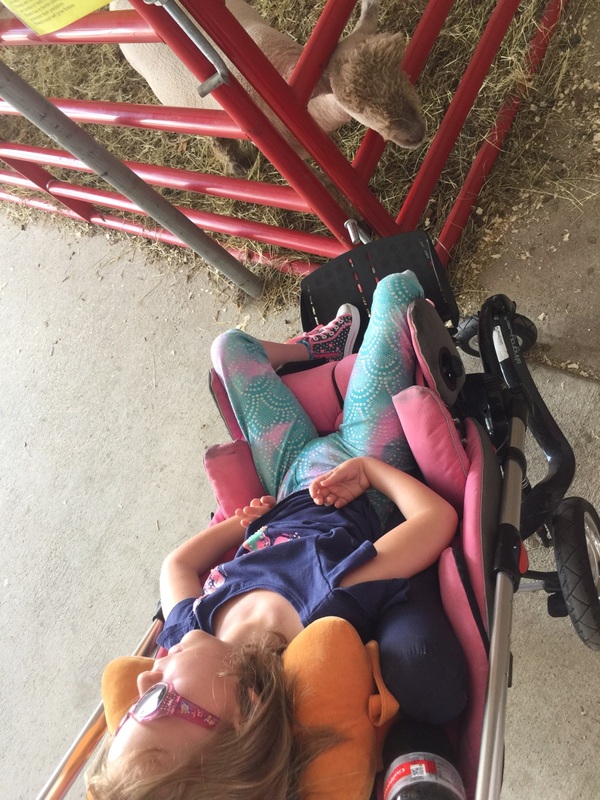 Grace hanging out with Jonah Elvidge's sheep. The fair almost always revolves around food for us (ie. the aforementioned mini donuts), so our first stop was at the commodities pavilion for a burger, an italian beef and a hot dog. Charley was supposed to get the hot dog, but decided to hold out for something else instead. Charley would have stayed all day in the ag tent playing with the corn. After lunch, we made our way to the FFA petting zoo, which was a highlight of our trip. Neither Mary nor I did FFA when we were in school, but we have a great fondness for the program. Grace, a little tired from PT, slept through most of the excursion, but we may have a future farmer on our hands with Charley. 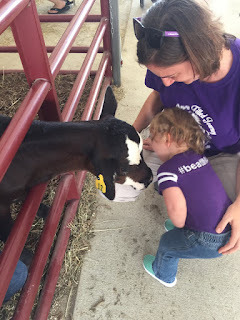 After a brief and hesitant encounter with a bunny, Charley warmed up to the baby calf, trying to kiss it on the nose. The calf was equally affectionate, attempting to gnaw a hole in Mary's pants. Charley loved dancing (and trying to get in the puddles) to Liz Bentley. 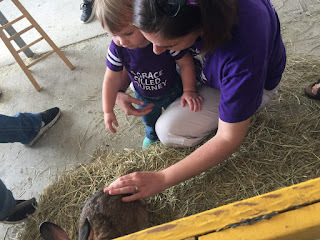 Just like Grace was when she was her age, Charley was equally attracted to the rest of the animals, not always willing to pet, but definitely content to check out the goat, baby chicken and lamb, which belonged to Jonah Elvidge. The Elvidge family have been huge supporters of Grace and our journey so it was cool to see their name on the side of the pen for everyone to see. We were also awful proud to see Hillsboro's Peyton Tester's picture in the exhibit honoring all of this year's star farmers. Professor Longhair included Grace in his magic show at Kids Korner. Cheesing with Professor Longhair after his show. 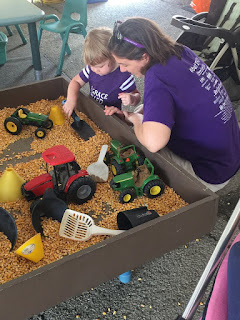 After the FFA exhibit, we went to an Illinois Agriculture tent, where Charley could have stayed for hours playing in the corn and with the tractors. We made a brief stop at the Illinois State Police tent, then headed to the dairy barn for a cream puff and some ice cream. By this time Grace had woken up and Charley thought the ice cream sounded better than the hot dog, so we found a spot under the Lincoln Stage pavilion to feed the girls. Mommy's favorite exhibit is the butter cow! It turned out to be a perfect fit as Mary fed Grace while we listened to Liz Bentley sing on stage. We really enjoyed the music (Charley even danced a little) and we hope that Miss Bentley continues on her path. 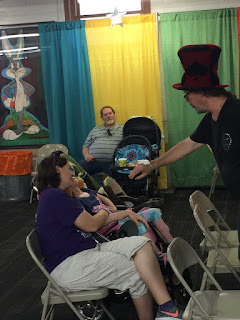 By the time Grace was done eating, the rain had stopped and we made our way to the Kids Corner, where Grace's friend Professor Longhair was doing a magic show. The good professor has performed at both of the Grace 5K races and has been an awesome friend to our little girl. 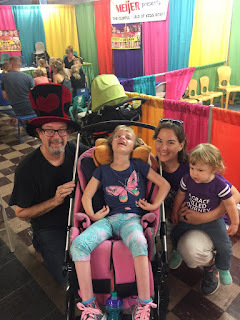 We really enjoyed the magic show and we were touched that Professor Longhair always made sure to come to the back row where we sat to make sure that Grace saw the trick too. People that talk to Grace and treat her like every other kiddo are our favorites. Our favorite little Mini Donut . 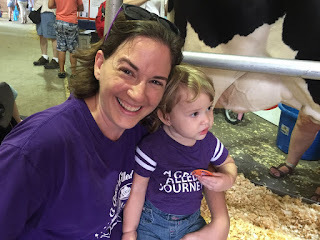 . .
Once the show finished, we had one last stop at the cow barn, where Charley tried her hand at milking a cow. Again, I think we have a future farmer on our hands. Who knows, maybe Aunt Monica can get her into showing cattle. We made one last stop for some mini donuts and we made our way out of the fairgrounds with two sleepy girls. Charley got to milk a cow for the first time! 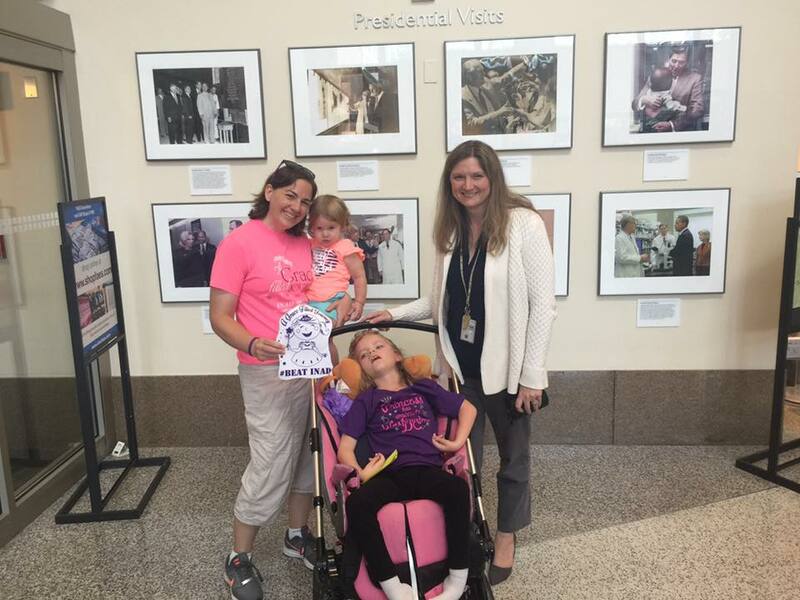 We made one more stop in Springfield at Grandma Kim's work to say hi before we went home though. Mini donuts are always her favorite so we wanted to make sure that she had a little pick me up while she finished up her Friday. Ever helpful, Charley made sure the bag wasn't too heavy and had five donuts while we waited for Grandma to come out. Both girls gave my mom big smiles when they saw her and it was an awesome end to the trip. 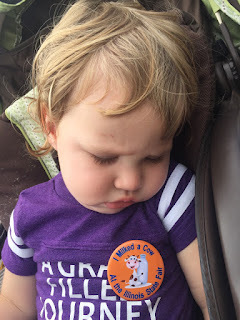 All tuckered out at the fair. It's not always going to work for us to go to the fair, but we are really glad that it did this year. 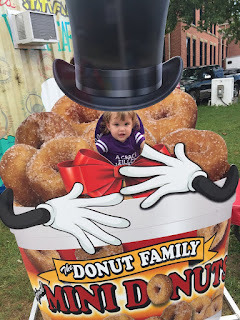 We had a lot of fun, took a lot of pictures and of course, ate quite a few mini donuts. Hopefully we can do the same next year. There were plenty of storylines regarding the 100th annual PGA Championship, held at Bellerive Country Club near St. Louis. There was Brooks Kopeka winning his second major of the year and third in 14 months. There was the return to form of Tiger Woods, who played like the Tiger of old and nearly caught Kopeka. 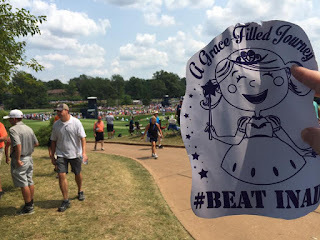 And there was the swarms of people who invaded the fairways of Bellerive and provided a spark to a city desperately in need of something positive. And that's just a taste of the stories from what was a truly special event. Flat Gracie thought the PGA trophy was huge! 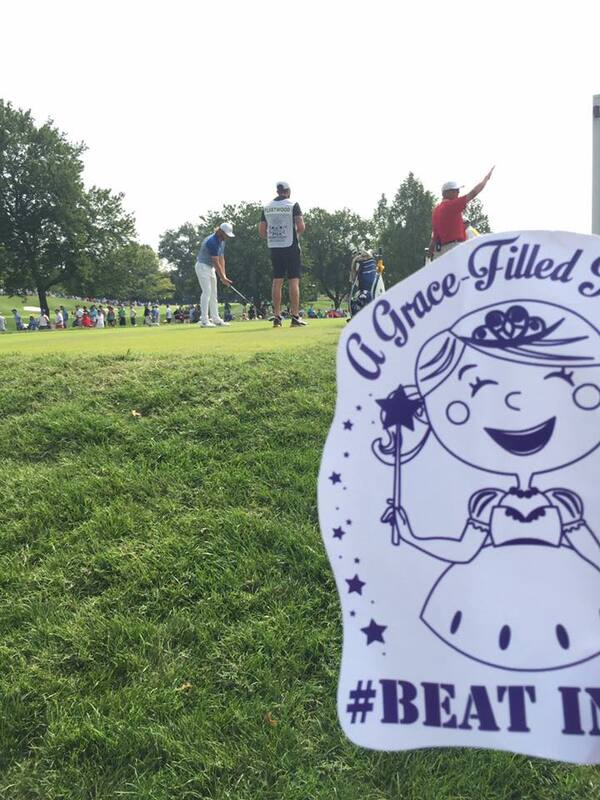 Flat Gracie checks out the leaderboard. 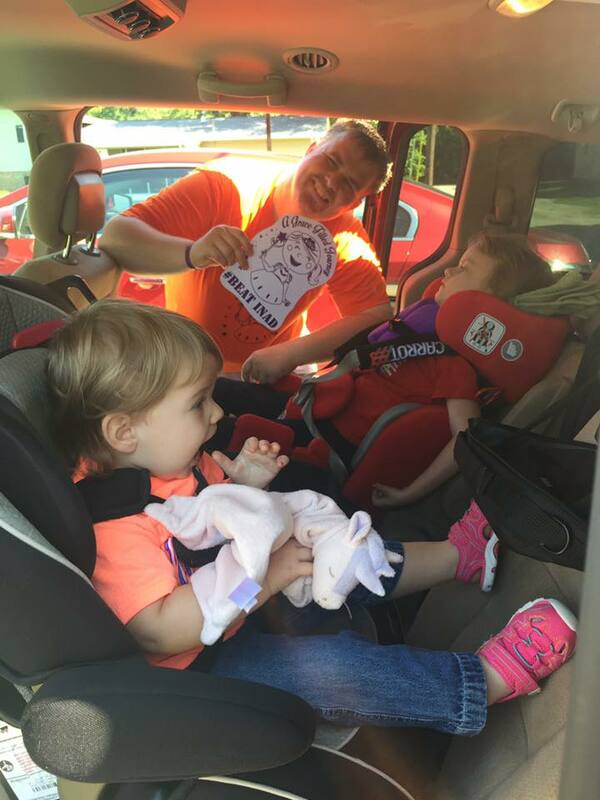 My focus however was on a small piece of paper adorned with a purple drawing of a princess and two slogans that have been a huge part of my family's life since November 2014. 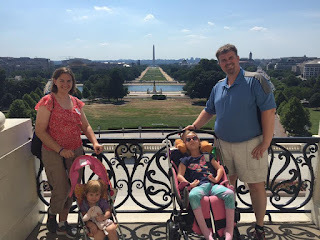 That was when we found out that our daughter Grace, who will be seven on Sept. 7, had a rare genetic disorder called infantile neuroaxonal dystrophy or INAD. 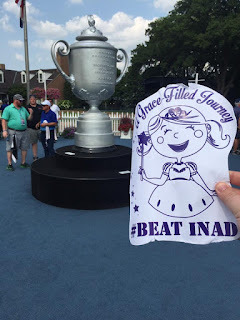 It's been a long road since then, with doctor visits, physical therapy and a lot of tears, but it truly has been a Grace-Filled Journey, one of the two aforementioned slogans. 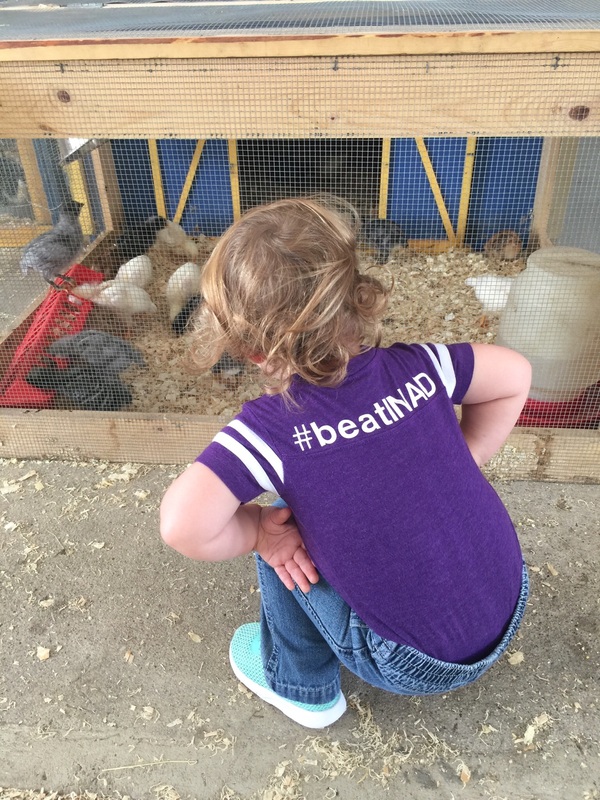 The other words on the sign were #BeatINAD, which is more of a rallying cry. 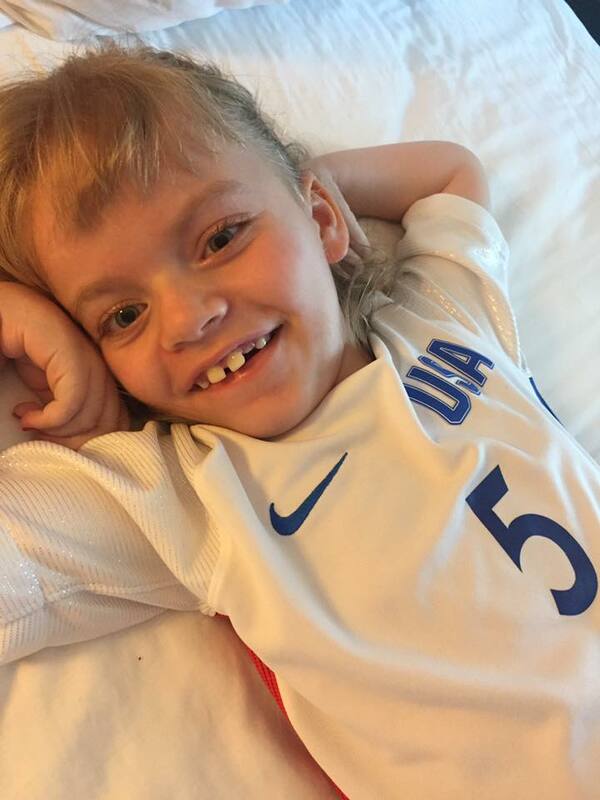 Since we learned of Grace's condition, we've raised close to $200,000 for INAD research in hopes of one day curing our little girl. Even if that never happens, we feel truly blessed that our small county of fewer than 30,000 people has shown us such love and support. Flat Gracie checks out the fairway at Bellerive. 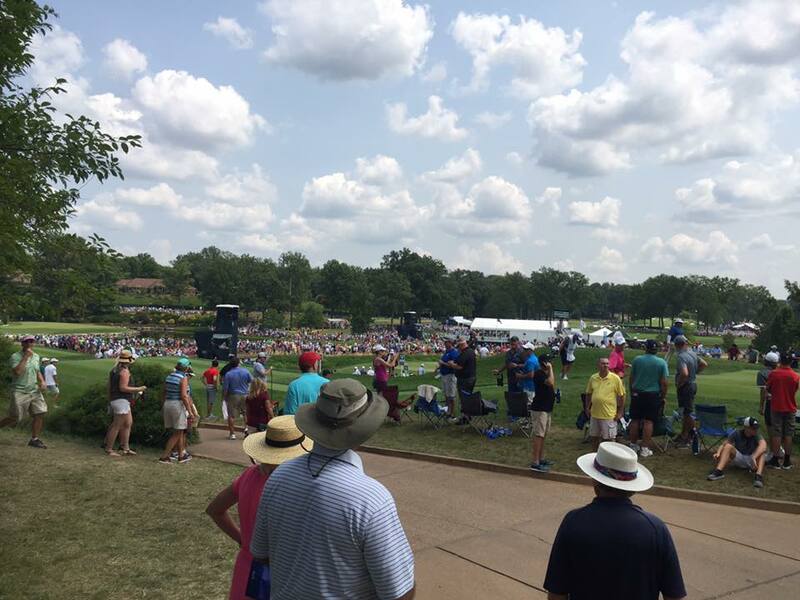 Throngs of golf fans came out to the PGA tournament. But back to the PGA Championships. 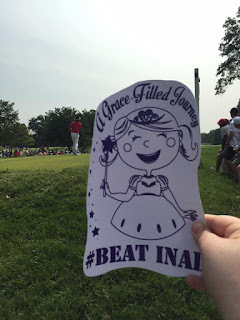 Prior to Sunday, I had never been to a PGA event, let alone a major. The closest I had come was covering an LPGA tournament in Springfield, IL, for the newspaper that my beautiful wife Mary and I both work for. That was cool, but Sunday's final round was a different animal entirely. I'm a novice PGA fan at best, so attending the event in person wasn't really on my radar until my brother Daniel texted me that his wife Monica had received four tickets through her job in Columbia, MO. I almost turned them down, Sunday is a busy day for us at the paper, but I thought better of it and made plans to head to Bellerive. You couldn't help but be in awe of the talent of these players. Par is a bad day. Bogeys and doubles are almost unfathomable. For me, it's a miracle if get out of the clubhouse without putting a ball in the water. 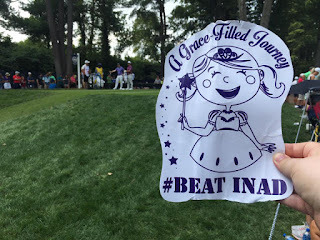 It was one of the first times that I really understood the passion that golf fans have for the sport. Since neither my brother, nor the other two guys joining us had ever been to a PGA event before, we just wandered around and tried not to look too out of place. 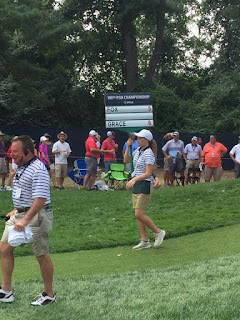 Eventually we made it to the first hole, just in time to watch Rory McIlroy, one of the best players in the world. 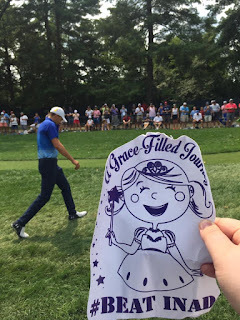 As McIlroy and Michael Lorenzo-Vera made their way down the first fairway, my attention turned to the rolled up paper with the princess on it. 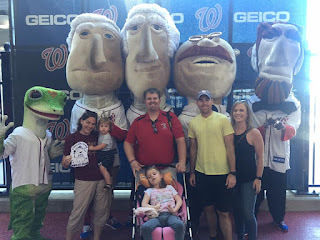 Flat Gracie, which we had dubbed the sign, had already made appearances on our vacation to Washington D.C. and Mary's trip to the Superman statue in Metropolis. 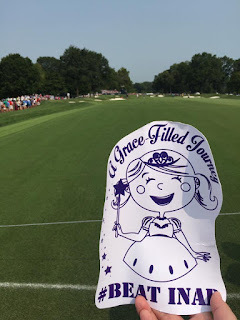 Similar to the Flat Stanley project that many elementary school students partake in, our thought is that our friends and followers on social media might get a kick out of where Flat Gracie might end up. 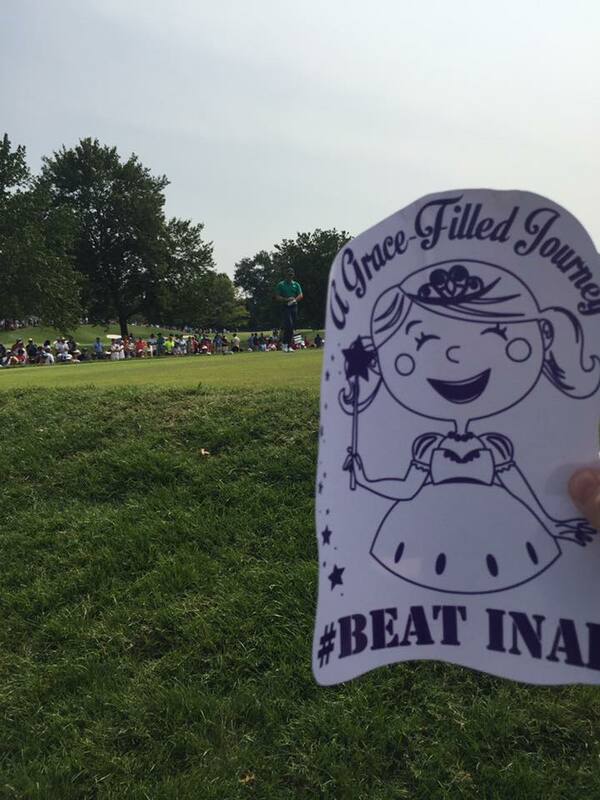 Flat Gracie checked out the PGA fans. That first photo led to dozens more as I took every chance I could to snap Flat Gracie's picture with some of the best golfers in the world, plus a few guys that just seemed cool. In addition to McIllroy and Lorenzo-Vera, I also got Flat Gracie pics while Tommy Fleetwood and Jordan Speith were playing through. Our new favorite golfer, Branden Grace. 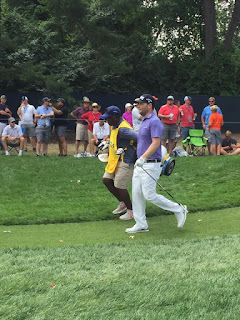 My favorite shots though are the ones with Branden Grace, a South African golfer who I didn't know existed until Sunday. I'm not sure if it's God putting these things in front of us or just happenstance, but our lives seem to be filled with links to Grace. It's led us on some amazing adventures and has created some great friendships, like the one with James Beard Award nominee Rick Lewis of St. Louis' Grace Meat+Three restaurant. 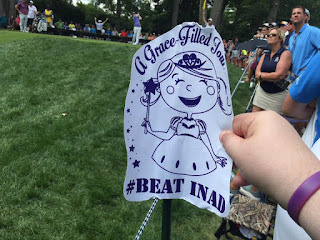 I'm hoping to reach out to our new favorite golfer on social media, but even if we never connect, it's pretty cool that he and Grace share the name. Flat Gracie followed golfer Branden Grace. With work looming, I left around 3 p.m. to make my way back to Hillsboro, IL. It was tempting to blow off work, with the roar of Tigermania echoing in the distance, but duty called. After all, I had been to an event that some could only dream of and had made a ton of good memories with my brother and Flat Gracie. 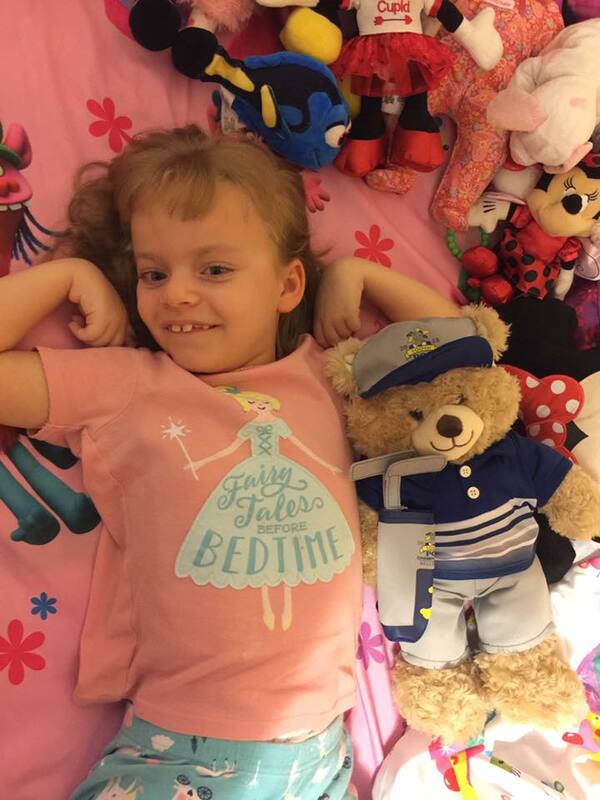 Grace loved her new "Brooks" teddy bear. Before leaving, I stopped at the pro shop to pick up a few souvenirs for the girls at home, a bear we named "Brooks" in honor of the champ for Grace, a sippy cup for her little sister Charlotte (aka Charley Danger) and a fun pair of socks for Mary with the tournament logo on them. 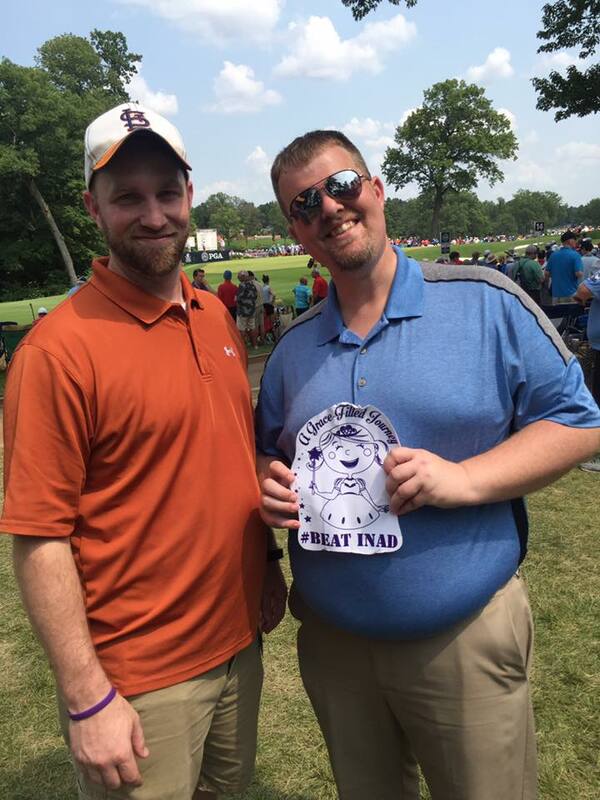 I managed to snag a couple logo golf balls and a Tervis cup for myself as well, just as a reminder of the day. Not that I needed one on the way home or that night. 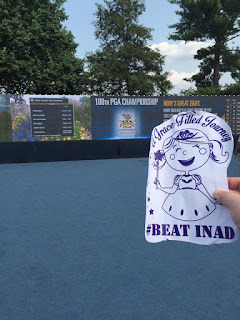 My thoughts hovered around how much fun I had at Bellerive and how blessed I am to have that opportunity to go and raise a little awareness for INAD. While we try to give Grace as many experiences as possible, some things, like the tournament, just aren't in the cards. Even if she's not with us in person though, Grace is always in our hearts and on our minds. Everything I do is because of that little girl and like the 100th PGA Championships, being her dad is a once in a lifetime opportunity.